A fun, quick boardgame is a good thing any time, and this past weekend at Metropolitan Wargamers in Brooklyn I tried my hand at a couple which were new to me. In King of Tokyo and Chinatown, players get to run through some very quick gaming (less than hour each) under very different mechanics and themes. Whether you’re a fan of old Godzilla movies, remember playing with Shogun Warriors toys in the 1970s or caught this summer’s Pacific Rim, 2011’s King of Tokyo may be just the thing for you. 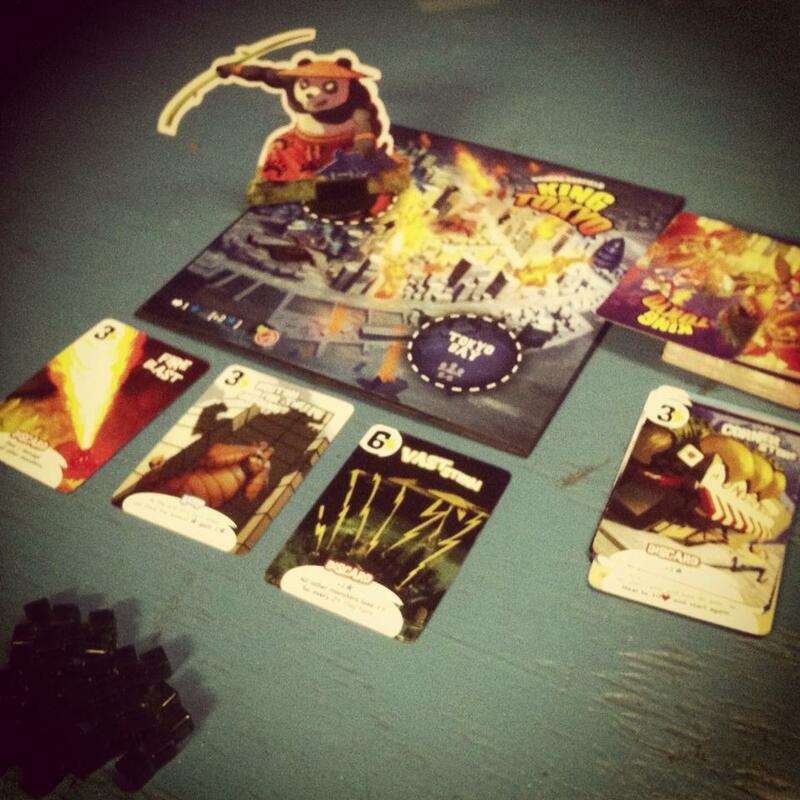 Battling as giant monsters like Gigazaur, Cyber Bunny, Alienoid, Meka Dragon or Pandakai, players duke it out through a cartoonishly-funny game to become the ultimate King of Tokyo. Each turn, a player rolls six special dice with values of 1 through 3 or a symbol indicating an Attack, Heal or Energy result. Numbers score victory points, Attacks take swipes at other monsters, Heals allow you to regain health points or evolve your monster, and Energy results allow for the collection of green cubes to spend on special ability cards. With three Heart results, not only does your monster heal but it also allows you to pull an Evolve card which gives you monster specific upgrades. Players choose to re-roll some or all of their dice three times each turn before finishing up and passing the dice. Through the “king of the hill” action of the game, monsters jump in and out of Tokyo to heal and avoid being attacked by the other menacing players. Once you’re strong enough, you can choose to charge your monster back into Tokyo. The special ability and evolution cards give you added strengths to affect your and your opponents’ monsters. The expansions for the game add additional cards and room for 5-7 players so two monsters can occupy Tokyo and nearby Tokyo Bay simultaneously. The artwork of the cards and combinations of monster evolutions and special cards makes for a lot of variety and fun as the monsters pound away at each other until 20 victory points are achieved or all other monsters are destroyed. There’s no battling monsters or references to Roman Polanski’s classic 1974 modern noir movie Chinatown in the boardgame Chinatown, but a different kind of intrigue abounds on these streets. 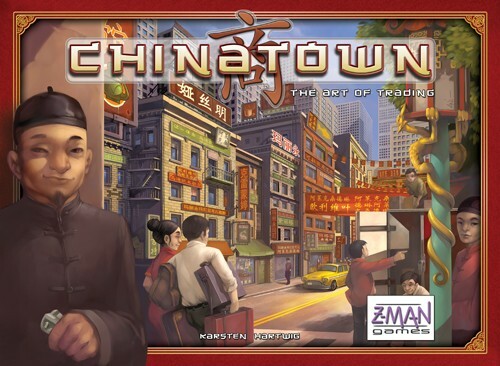 Released in 1999 by Z-Man Games, Chinatown is a club favorite at this point for its pure economic strategy play. In the game, a map shows a series a of city blocks with numbered lots all set within the street grid of Chinatown. 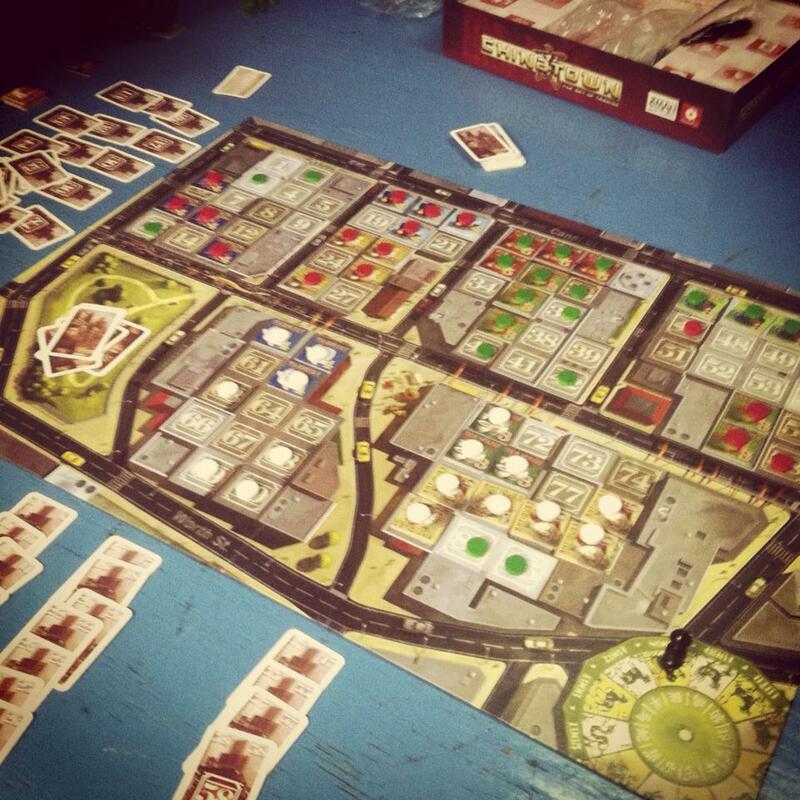 In six turns (or years), each player first draws and selects random building lots and businesses. Businesses include such common Chinatown landmarks like dim sum restaurants, pet stores, antique shops, florists, jewelers, laundries and factories. Players need to build businesses on their lots to earn rent. For example, a tea house requires three contiguous lots to complete while a restaurant requires six. The bigger the business, the more rent collected at the end of each turn. Partially-completed businesses can score modestly (maybe $10,000 per turn) but a sprawling big business can earn big money each round ($100,000 or more). Strategy might focus on completing multiple small businesses, one or two larger ones or a mixture of businesses of all sizes. The player with the most money at the end of the game wins. Unlike a more typical economic game like Monopoly, Chinatown is very fluid and involves little in the way of traditional game mechanics. There is no set play within a turn, no dice and a minimal amount of chance in the game. Players can buy or trade combinations of lots, businesses and money through an open negotiation process which only ends when there’s an agreement for no more that round. You might offer a business another player needs in exchange for a building lot you need on one of your blocks. During the draw phase, not only are you thinking of the lots you need to build your businesses but those which may prove valuable to your opponents. Balancing what you earn in a trade and what another player may gain in the exchange makes for both a competitive and collaborative game, much like the environemnt you would fine in any dense Chinatown. 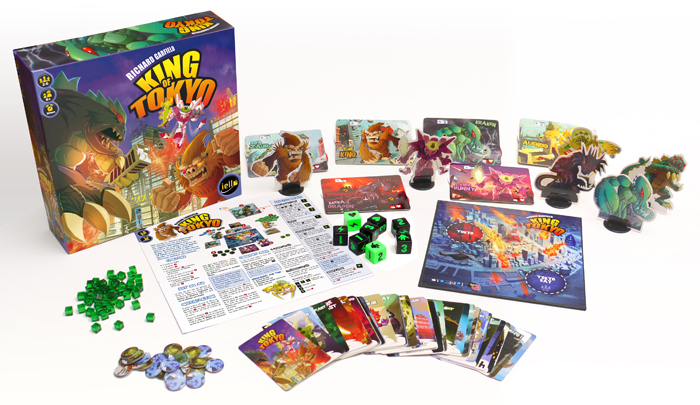 Whether you’re up for some giant monsters slugging it out in Tokyo or some urban development on the crowded streets of Chinatown, both King of Tokyo and Chinatown make for very different but very entertaining games. At just around $40 each, these games are a sure thing for any group of new or experienced gamers looking for some quick yet engaging play. ← Retro Gaming The 70s & 80s: Survive!